Detection and quantification of fetal red blood cells (RBCs) in maternal blood samples is essential for obstetrical management. Measurement of fetal RBCs is critical as the extent of Fetomaternal Hemorrhage (FMH), the transplacental passage of fetal RBCs into the maternal circulation, has consequences for further treatment of mother and child. Frequency and size of FMH is directly influenced by complications in abdominal trauma, suspected placental injury or after a caesarean section. Severe FMH may lead to intra-uterine death. In case of antigen incompatibility between mother and child FMH may result in respiratory problems or anaemia, like Haemolytic Disease of the Newborn. The detection (and thus enumeration) of fetal red blood cells (fRBCs) is used to calculate the extent of FMH, either in case of trauma with suspected placental injury or in the situation of a RhD incompatibility between the fetus and the mother. The amount of fRBCs is a measure for the prevention of hemolytic disease of the newborn using (prophylactic) anti-D therapy. By flow cytometry, BRAD 3 FITC can be used to accurately quantitate the number of RhD positive cells in a mixture of RhD positive and negative cells. Therefore FMH can be analyzed in a maternal blood sample when a negative woman carries a RhD positive fetus. For optimal interpretation of the results the kit contains an anti-RhD antibody (BRAD 3) and a negative control antibody (AEVZ 5.3) both labeled with FITC. Figure: The figure shows the results of BRAD 3 FITC and AEVZ 5.3 FITC. 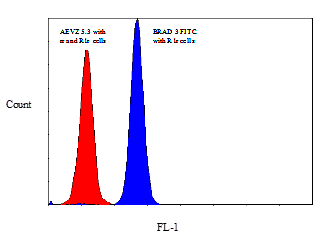 The red histogram is AEVZ5.3 with negative cells. The blue histogram is BRAD 3 FITC with RhD positive cells. The FMH Kit can be used only in case of rhesus incompatibility between mother and child. For all other cases the Fetal Cell Count™ Kit are recommended.